Home › Electronics › Car Mount Phone Holder Cradle Geekee 3-In-1 Universal Car Phone Mount Air Ven.. Car Mount Phone Holder Cradle Geekee 3-In-1 Universal Car Phone Mount Air Ven..
3-IN-1 DESIGN: This handy car mount holder can be wall-mounted or clipped to your car's air vent/dashboard mount/ windshield mount for convenience. HANDS FREE: Simple installation, no tools required.Easy one press button releases the device with just a push of a finger. SUPER STEADY: Features strong suction cup that will hold your device steady so you can keep your focus on the road and your hands on the steering wheel. BROAD COMPATIBILITY: Extendable grip accommodates devices between 2.0 inches and 3.7 inches width and with its soft padding, securely holds your device. Color:3in1 Car Mount Cradle Features and Specifications: Stretchable clamp canhold from 50mm to 92mm wide, super compatibility suitable for different sizesand types of equipment. Easy clean, easy to install, long lasting, highquality, 360 degree adjustability. The perfect gift for any occasion. Softrubber padding on this mount prevents scratches on your cell phone and strongsuction cup sticks securely on the windshield or dashboard. 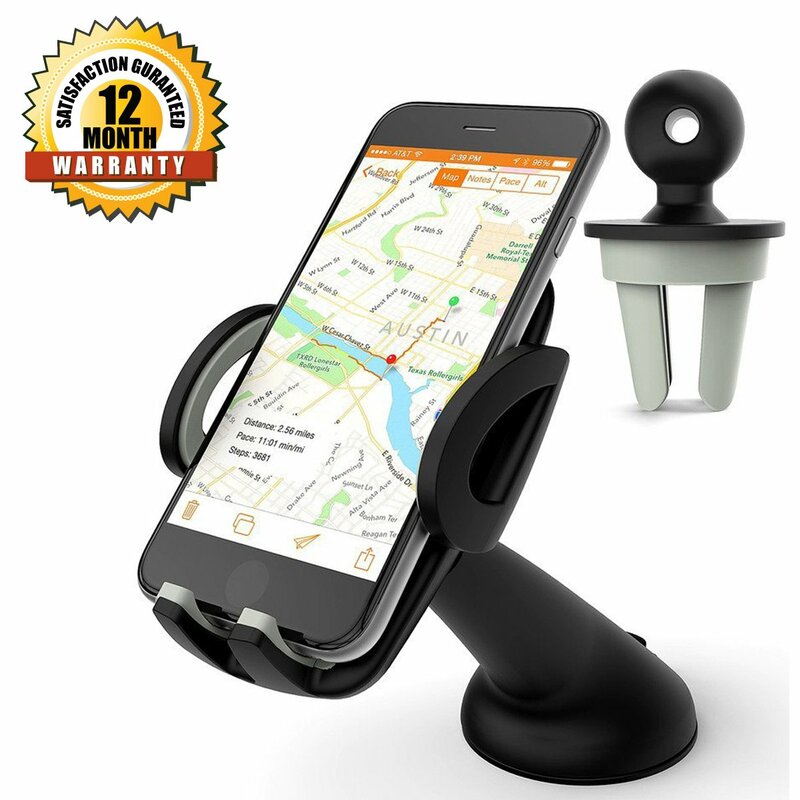 Universal Fit: TheGeekee 3 in 1 car phone mount fits for iPhone 6 Plus 6, 5 5S 5C 4 4S, SamsungS5 S4 S3 Note 4 3, Google Nexus 5, 4, HTC, LG, Fire and other smartphones.Package Contents: 1Geekee Windshield Car Mount Holder 1Air Vent ClipWarranty Policy: 12 months worry-free product guarantee from Geekee.Professional technical support. Efficient and always satisfying customerservice.